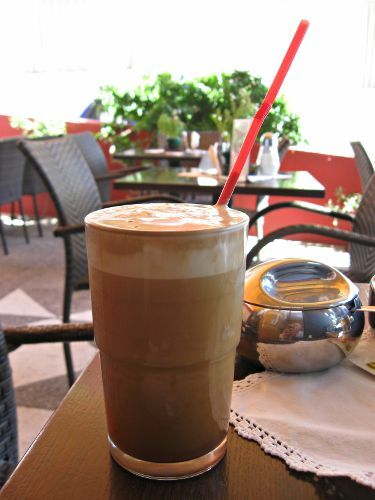 The frappé (φραπές) is a drink I had never heard of until my first visit to Greece in 2000. 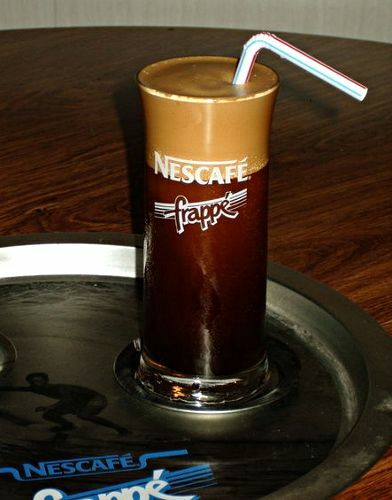 A frappé is instant coffee (Nescafé) blended to a foam with a small bit of water. Then more cold water is added to fill the glass. A frappé tastes exactly what it sounds like: foamy instant coffee with cold water and a couple of ice cubes added to it. I am not a fan of frappés (or any kind of instant coffee), but it's worth ordering one to try the experience. When they ask if you would like sugar and milk in it, say "yes," and it will taste better. The foam on the top thickens up after a few minutes. Wikipedia has an in-depth analysis of frappé bubbles that explains why the frappé foam thickens differently from regular coffee. Basically, the spray-dried instant coffee has little oil compared to regular coffee. The low amount of oils, combined with the sugar, makes a thicker foam that doesn't easily collapse. The thick foam will still be there 30 minutes later. Have you tried frappés in Greece? What did you think? Submitted by brandy bell (not verified) on Fri, 12/07/2012 - 06:48. I just LOVE a Frappe-- a hot Greek afternoon and there's nothing better... however, I don't think of it as a coffee, more like an ice cream treat. Took me FOREVER to figure out how they got the bubbles like that. thank you wikipedia. Josh I am going to include this on my international infographic on coffee :) thank you! Submitted by Josh on Fri, 12/07/2012 - 10:11. Some places serve frappes with ice cream added if you ask. I had a difficult time finding an iced coffee in Europe. Every time I would order an iced coffee I would get a coffee with ice cream in it. In Greece, the closest thing that I found, other than a frappe, is the freddo cappuccino. For more coffee, check out cold-brewed iced coffee and Vietnamese coffee from one of my other blogs.